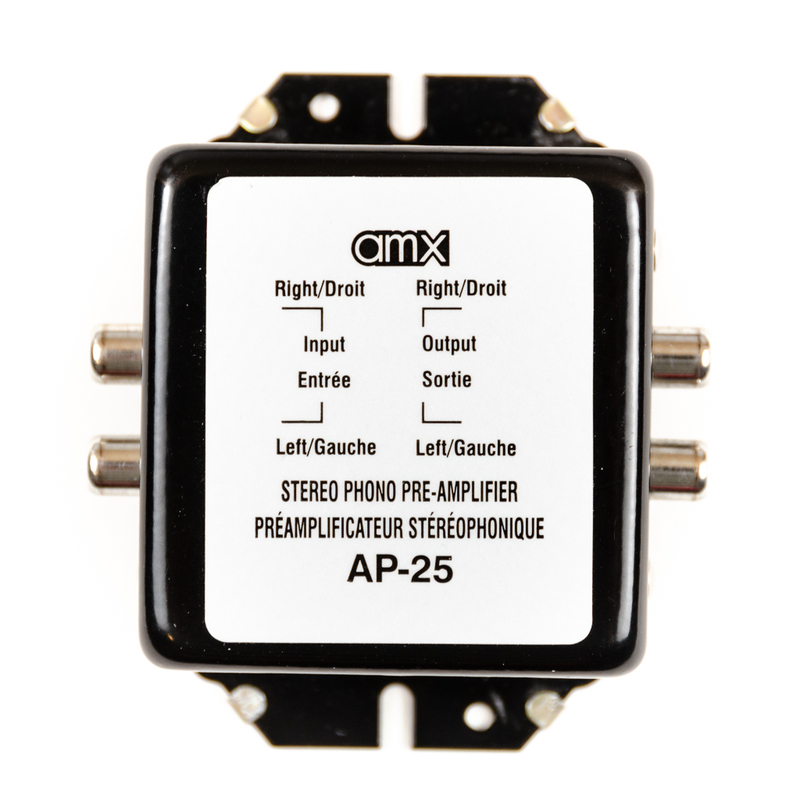 The phono preamp is an AMX AP-25. This one is quite old, but looking around, it seems to be still available for purchase, although it is now inside a different enclosure. The original power supply that came with the preamp was lost and my friend replaced it with a cheap 9V DC power supply he just bought. The power requirements aren’t written on the old preamp, but on newer AP-25, it is clearly labeled that it needs 9V DC with a center positive pin. 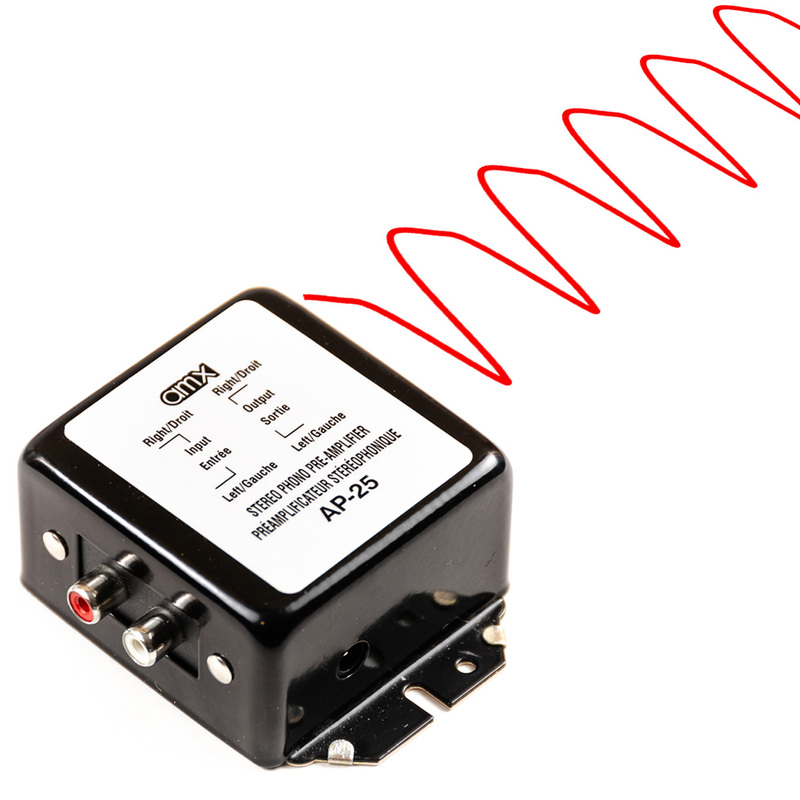 The current requirement is unknown, but probably very low, since it is a signal amplifier, not a power amplifier. People in North America have probably heard this humming noise. It is typical humming generated from devices connected to the AC power grid running at 60Hz. The hum itself is generally at twice the grid frequency, so 120Hz. Transformers will often vibrate at this frequency. Fully rectified AC signal will also generate a 120Hz signal. 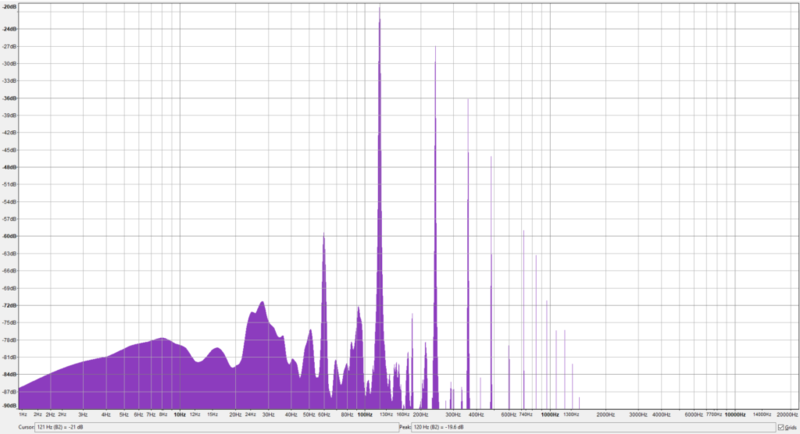 To get a better idea of the type of noise, we plot the spectrum of the noise, as shown below. We see that the noise main frequency component is 120Hz as expected. The harmonics (240Hz, 360Hz, etc.) of the main component are also present. There is also a 60Hz component, but 40dB lower than the 120Hz component. My hypothesis is that the 60Hz signal is picked up from the environment by the amplifier, whereas the much stronger 120Hz signal is coming from the power supply. With this information, we can narrow the investigation to the power supply. 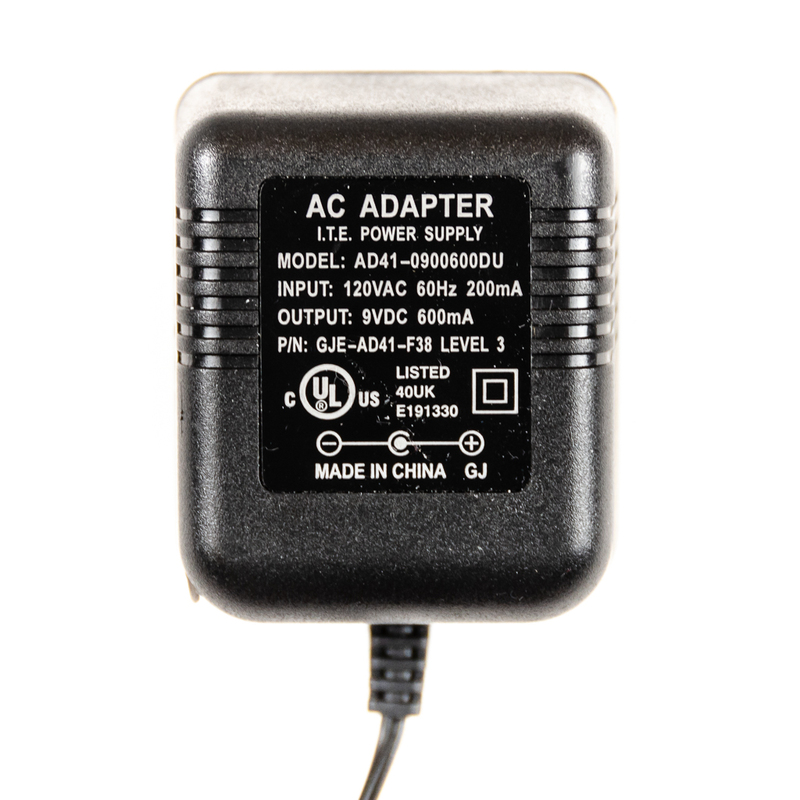 The specifications written on the power supply label are shown in the table below. We measure the DC output of the power supply under different load conditions to verify if the power supply is working as expected. The results are displayed in the table below. We also plotted the output voltage as a function of the output current in the figure below. Power supply measured output voltage as a function of output current. The output voltage is higher than specified. Under no load, the output voltage is more than 30% over the specification! The preamp should function normally even if the power supply is higher than normal, but it is far from ideal. Also, the output voltage decreases as the current increases. This indicates that there is no output voltage regulation inside the power supply. The poor results of the power supply, its relatively large size for its specifications and its heavy weight indicates that it is probably a very simple design with a transformer to step down the AC voltage, followed by a full bridge rectifier to rectify the signal and finally a large capacitor to filter the output. If the output was regulated, it would probably be a very good power supply for audio applications. Newer switched-mode power supplies are much more efficient, but are generally noisier, since they switch the current at very high frequencies. They require more care in filtering the output to avoid noise. A simple transformer power supply with a linear regulator is inefficient, but much less noisy. Unfortunately, the power supply we are analyzing lacks the last important step, voltage regulation. An important measurement for a DC power supply is the amount of AC ripple present on the output of the power supply. We measured the AC RMS voltage of the output at the same load conditions as the DC measurements and we obtained the results in the table below. The recorded sound was recorded as is, with no amplification. If we compare this recorded signal with the recorded noise coming out of the preamp, we realize they sound almost the same. The power supply AC ripple only has a lower amplitude. 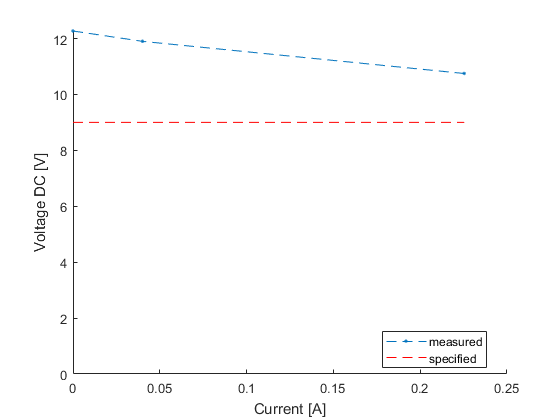 We can verify they are similar by plotting the spectrum of the AC ripple as shown in the figure below. 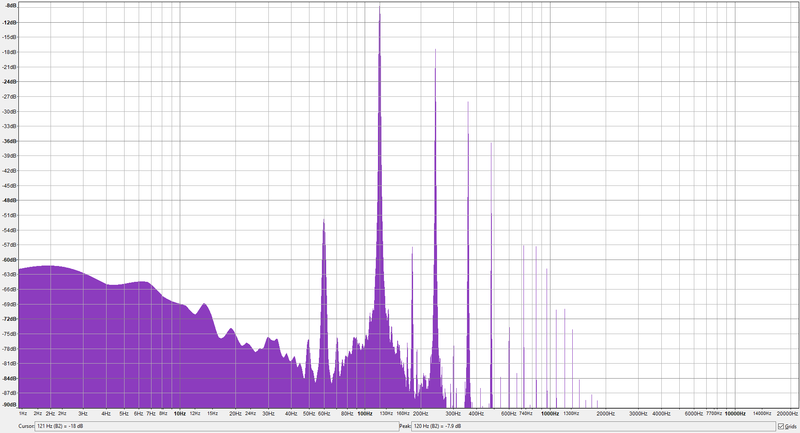 Power supply output noise spectrum. We see that the noise on the power supply output has the same signature has the noise out of the preamp output. A strong 120Hz component and all of its harmonics. With this information, I am confident that the cheap power supply is the source of the noise coming out of this AMX AP-25 phono preamp. The unregulated power supply has a strong 120Hz AC ripple that is picked up and amplified by the preamp. A quick and inexpensive solution to this problem would be to purchase a good 9V power supply. Unfortunately, it is not so easy to know beforehand if a power supply is well regulated with little ripple. They are generally no-name brands and reviews don’t help, since most applications don’t require a well regulated power supply. 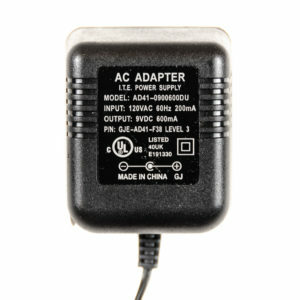 For a consumer, a badly regulated power supply will work in most applications outside of audio. Another solution would be to buy a new preamp which comes with a power supply. Since it is sold as a unit, it should not be noisy, otherwise people would return it. 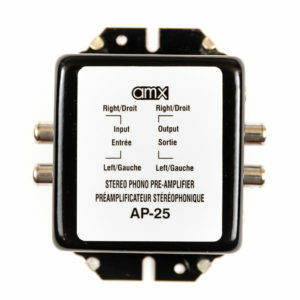 But a new low-end phono preamp, such as a new AMX AP-25, is around $30+ CAD. I have a feeling that with only a few electronic components, it would be possible to filter the power supply output and solve the problem. I am currently working on such a solution and will keep you posted on the progress.